Pomades are a great product for almost every hair type, style, and thickness. As far back as the Roman era, people have been beautifying themselves by creatively styling their hair. Romans actually used soap as their preferred styling product. Many years later, in the 19th century, bear fat became the main ingredient in what would be considered an early pomade. The early 20th century saw the introduction of beeswax, petroleum jelly, and lard. Some of the original pomades were Brylcreem, Murray’s Superior Pomade, and Royal Crown Hair Dressing, all of which are still on the market today, some with their original looks. From the early 40s through the 60s, Dixie Peach Hair Pomade became the popular brand among teen boys, also still available. Gaining and losing steam over the decades, pomades have been used by both men and women. Pomades can be used on either wet or dry hair, depending on whether you want a shine (wet hair) or not (dry hair). Pomade can even give your hair texture while it holds your chosen style in place for long periods of time. Not just for the hair on your head, pomade helps style and tame all lengths and shapes of beards and mustaches as well. There are two major types of pomade - water based and oil/petroleum based. Oil/petroleum based pomades are the originals. Made of real grease and fatty ingredients, these pomades hold strong and give you that shiny look. Water based pomades are easier to wash out as they are water soluble and can be better for your scalp as they are better at letting it breathe. Leaving petroleum pomade on your scalp too long can prevent oxygen from getting to your pores, which leads to itchy scalp, acne, and other hair and skin issues. Regardless of the thickness of your hair, you can find a pomade that will fix any issues you have. If you have thin hair, you want a pomade that helps to thicken without weighing your hair down. Straight hair you want a pomade that won’t leave a tacky residue and you probably only want it on your hair fro the middle length to the end. 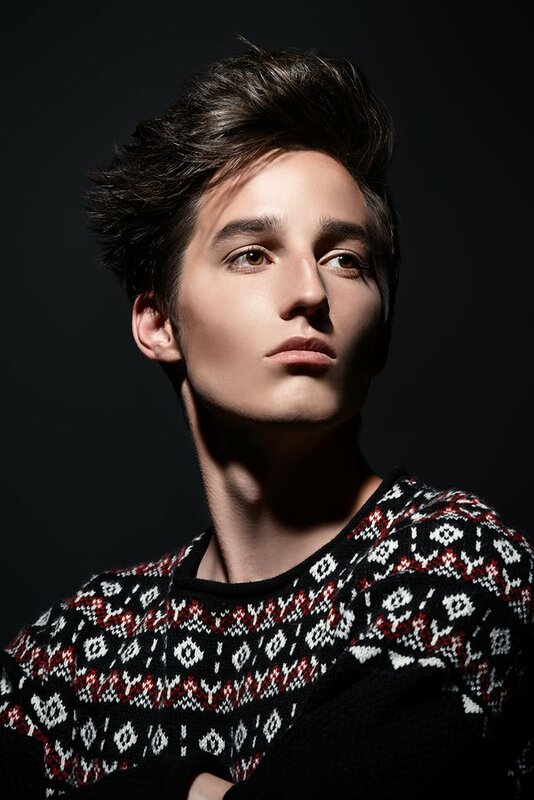 Wavy hair needs a pomade to give you a soft, tousled look and texture. But if you have thick hair, you have a whole different set of issues to address. Thick hair equals knots, and not easy to comb knots, but big knots. It also means conditioner is your best friend and not the volumizing kind, which can send your thick hair out of control. Thick hair needs a pomade with firm hold, like a wax, and with no volumizing assistance. One of the great benefits of pomade is you get superior hold that doesn’t leave your hair crunchy like gels or mousse. Because they are creamier than wax, pomades are more ideal than mousse or gels for people with thick. 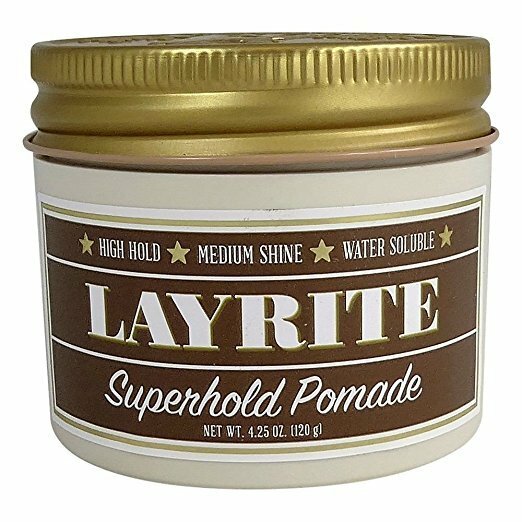 Layrite Superhold Pomade is top notch when it comes to hold - more like a wax. One of the best pomades for thick hair, this product is easy to restyle without drying out your hair. WIth all that hold, you will not get texture or volume, but you will get a fantastic scent. This one is easily washed out and offers a medium shine, which can be pumped up if applied to wet hair or lessened when applied to dry. Layrite is a solid choice for anyone looking for a strong hold, good control and natural shine. 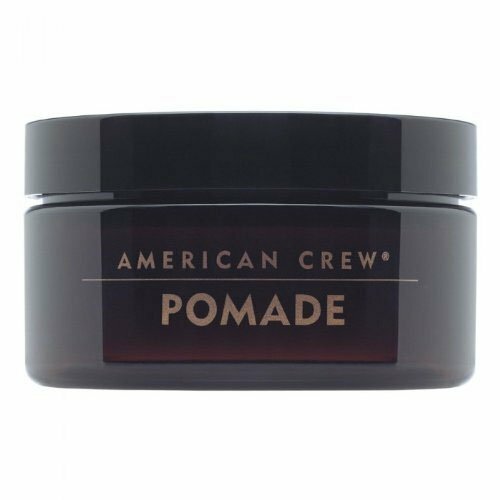 American Crew Hair Styling Pomade gives you an incredibly strong hold at a reasonable price. One of the few pomades that works well on hair lengths, this one is perfect for longer and curly hair. Claiming to be a medium hold pomade, this one gives you a much stronger hold than that. Restyling with this one is not one of the better ones, but you do get a great shine and wonderful scent. An easy to apply and easy to wash out product, American Crew gives you a medium shine that looks more natural without too much shine. The scent is quite a manly one making this a great middle of the road pomade. 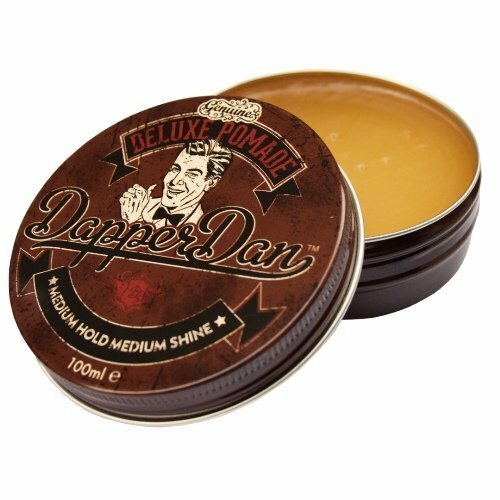 Dapper Dan Deluxe Pomade is one of the best smelling scents in pomade. Men and women alike enjoy this citrus and vanilla fragrance. Offering a medium hold that’s not too weak, this one is easy to apply and wash out. A water based pomade with a luscious consistency, you can easily restyle your do throughout the day with just a bit of water. If you’re looking to get texture with your pomade, this is not the one for you. Dapper Dan will give you more of a slick look than a natural one, but won’t get flaky and will quickly shampoo out. This one is pricier than others, but having the brand in your house will boost your cool factor. 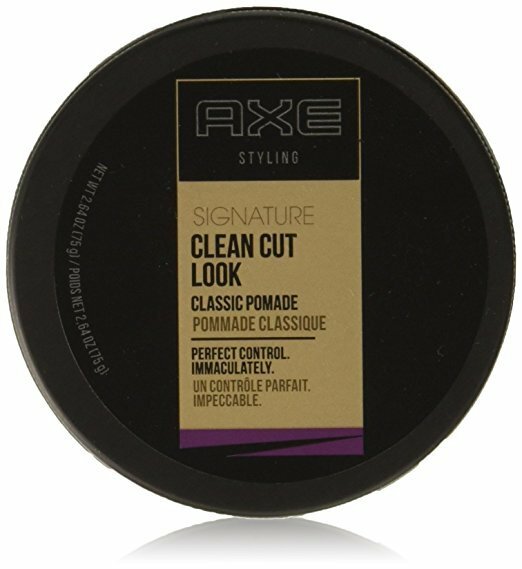 Axe Clean Cut Look Classic Pomade has a clean scent that doesn’t compete with your favorite body spray or cologne. Giving you a medium or a strong hold with a slight polish that is best for short or mid-length hair. Axe makes great products for men, and this is no exception. Working as well on thick as curly hair, Axe doesn’t leave your hair looking wet. You don’t want to touch your styled hair too much, but with a little water, you can reshape your do once with positive outcome. Not a big contributor to your hair’s texture and it slightly shiny but a natural shine. Washing this one out of your hair will take an effort on your part, but that’s the price you pay for the hold. Mr. Natty Natty’s Pomade Wax is a light, sweet smelling pomade with excellent hold and low shine. It works as well on big pompadours as slick, short styles. Working as well with dry and wet hair, Mr. Natty gives you a firm hold that still has a supple texture. Keeping your flyaways in check is the best it will do on longer hair cuts and restyling it isn’t the best. You can also give your hair the appearance of more texture than it actually has. Because it’s a wax, it does require a little extra scrub time to get it out of your hair, but the smell is highly approved by its users. While you can find a fantastic pomade for virtually every hair length, thickness, and style, pomades are especially beneficial to those with thick hair. Thick hair presents its own set of problems and requires special handling to avoid flyaways, frizzy or heavy hair. The products you use in the shower and out of it are vital to keeping your locks under control and creating that amazing look you want. Whether you work your hair into a mohawk, a quiff, a fade, or lovely long locks, you can make any of them work with the right pomade. ANd not only can you create the perfect style, you can keep it all day or night - whether you’re working, studying, dancing, or dining out. After some practice, you will learn how to coif your do into a work of art. Who knows, you might even spawn a whole new hairstyle trend!